I have seen a lot of posts about making DIY scratch art paper, and it has been on my to do list for a long time. But I never got around to it, probably because it involves pulling out my paints, which always make a mess and involve a lot of clean up. 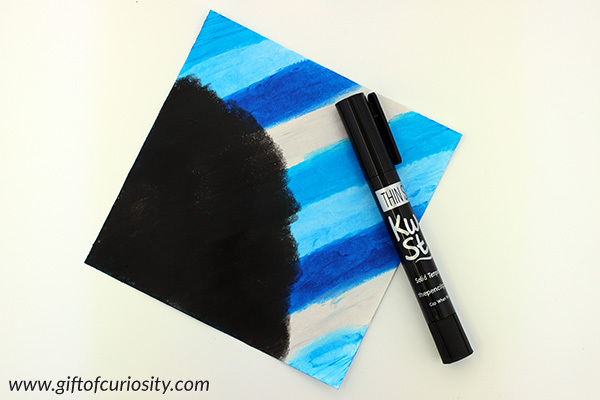 But then I discovered I could use Kwikstix Thin Stix solid tempera paints to make DIY scratch art paper without any of the mess normally involved in painting. And let me tell you, I was THRILLED with this discovery! I made several sheets of scratch art paper and my kids and I used them to create some beautiful snowflake scratch art for winter. Disclaimer: This post is sponsored by The Pencil Grip, maker of Kwik Stix and Thin Stix. I was compensated for writing this post. All opinions and ideas are my own. Kwikstix Thin Stix are solid tempera paints. This means they go on like a thick crayon but give the look of tempera paint. Given that they also dry super fast – in about 90 seconds – Kwikstix Thin Stix paints are virtually mess free. I never have to think twice about pulling out our Thin Stix (which is definitely not the case with our regular tempera paints). As an added bonus for kids with allergies, Thin Stix are egg, peanut, gluten, dairy, and soy free. The first step is to use a variety of Thin Stix colors to fill your entire piece of cardstock with paint. Be sure to cover every inch; it is important not to leave any blank spots. You can add color in any design you wish. For example, you can make stripes. You can also do colored splotches. Let the paint dry. Fortunately, with Thin Stix this will only take about 90 seconds. Once the paint is dry, use your black Thin Stix to completely paint over the colored layer you just applied. 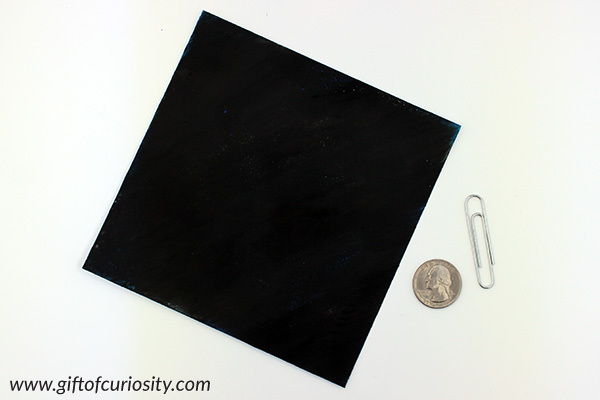 Once the entire piece of cardstock has been painted over with black, gather objects your kids can use to scratch off the paint. Paperclips and coins are good options. A pin puncher could also work for children old enough to use it safely. Then use your chosen material to draw lines in the black layer, revealing the colors underneath. We used a 30-60-90 triangle to get perfect angles on our six-sided snowflake (making this a math lesson as well as an art project). This blue and silver snowflake reminds me of a cold winter day. But this colorful snowflake is beautiful as well. 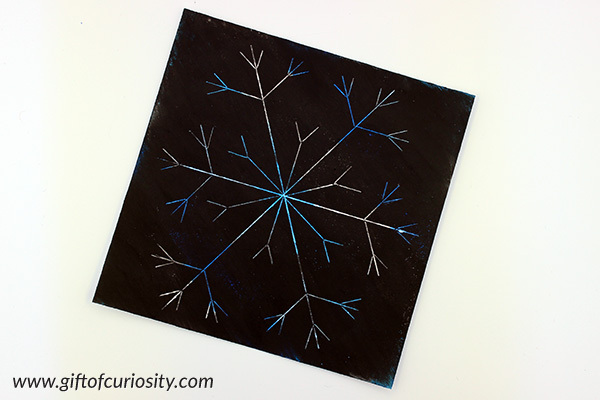 There’s no limit to the beautiful snowflakes you can create with this snowflake scratch art project. And with Thin Stix, making your own scratch art paper is both simple and mess-free. Thin Stix are available in stores such as Michaels, Walgreens, and BJs Wholesale, as well as online at Amazon. What else you can do with Thin Stix? See more on Instagram by following @KwikStixPaints. The makers of Kwikstix Thin Stix solid tempera paints have offered to send *THREE* lucky Gift of Curiosity readers a set of Kwik Stix paints. The Rafflecopter widget will ask you to “sign in” but that is only so we have a way to contact you if you should win. This giveaway is open to anyone 18 and older living in the US. Must provide mailing address to receive prize. The giveaway is open until 11:59 pm Pacific Time on November 28, 2017. Winners will be notified within 48 hours after the close of the giveaway and will have 48 hours to respond. If a winner does not respond within 48 hours, a new winner will be chosen. Gift of Curiosity is not responsible for prize delivery. Prize will be delivered by The Pencil Grip. My oldest daughter would LOVE THIS!! I would love to win this because my kids love doing art projects. I have never seen these before but I can tell my 8 year old would love them and we would have a blast making the snowflakes. Thank you for the chance! I help homeschool my grandkids and they would love to try these – and I would love the no mess factor! I would love a set of these paints to use with my preschool classes as well as my weekend sleepovers with my grandchildren! Thank you for all of your inspiring ideas! 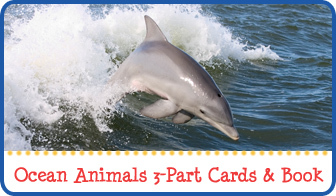 I was just looking at how to make scratch off cards but with some other (messier) options. I’m glad I found this post, thank you! 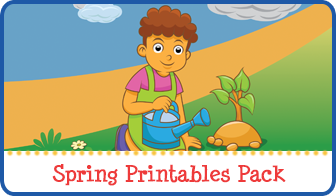 The kids in my class would LOVE to make their own scratch art paper and pictures! Grand kids coming for a month. We would love these pens. We’d love to win this set to use in our homeschool! My kiddos would love these! I would love to use these during pickle and ketchup time! I’m a Literacy Specialist and I work with first graders; this would be a great way to get them motivated to practice the correct pencil grip! These would be so much! So accessible for painting without the hassle. Love to make his own. Thanks for the post showing how-to, and for the giveaway! I love these! I have never thought of using them as scratch art. Brilliant!! These Kwik Stix look amazing! 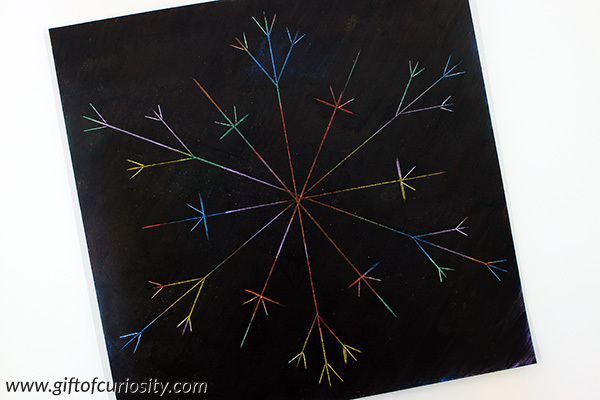 I’d love to try your snowflake scratch art with them, and see what else my 4 year old daughter and 8 year old son come up with! I love this! I have never heard of these. I have a newborn which makes it harder to supervise my 2 and 5 year olds during messy activities. These solid paints seem like a great way to make things a little easier for me. This is such a cool idea. I love that you don’t have to use messy paint. I think the holiday break is going to be more fun with this craft. My Daughter would love this she loves doing art projects with her friends. Thanks for the opportunity and showing me a craft medium I did not know about. I love this website! So much info, and brilliant ideas! This would be a great addition to my 1st Grade class. 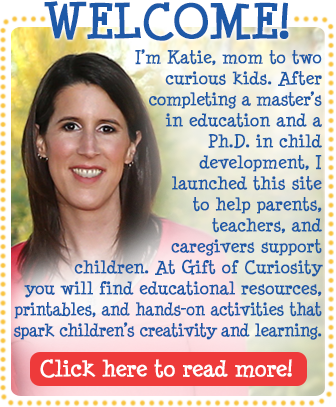 These would be great in my preschool homeschool classroom! 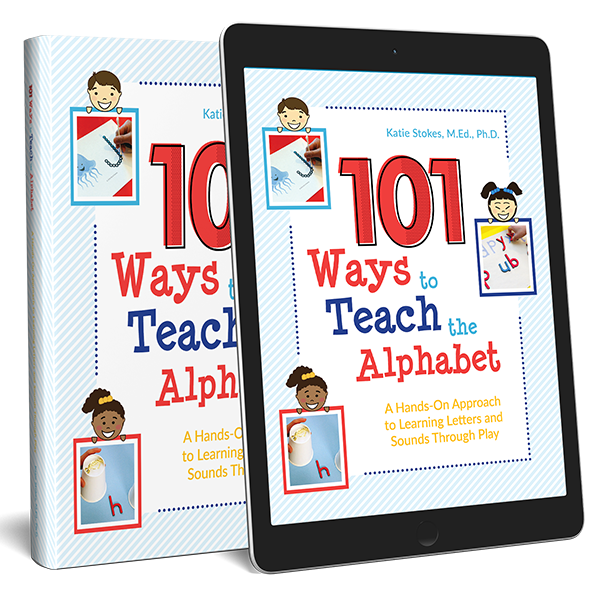 This will be perfect to do with my Pre-K class during our winter u it! 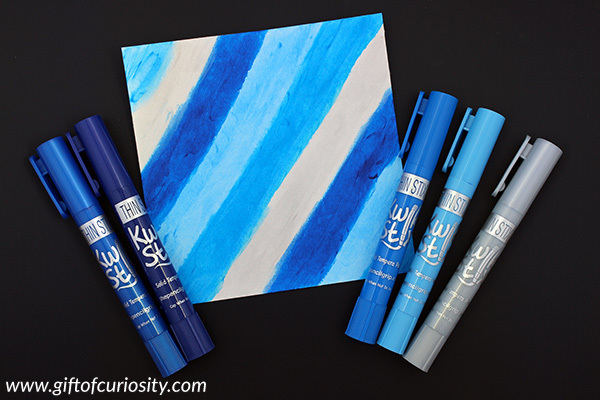 Kwik Stix sound like the perfect paint to use with my little ones! I have never heard of these. I love the “no mess” aspect. What a neat and easy way to add art to your day. I sometimes dread pulling paints out because of the mess that comes with it. The Kwik Stix look like a great solution. Love new finds! Fun! My son would love this! Thank you. We love color! This looks so fun. Scratch art has always fascinated me as a child and I too enjoy being able to create this for my kids! The tempura paint sticks are a great idea!! This would be amazing for my 1st grader!!!!!!!!!!!!!! 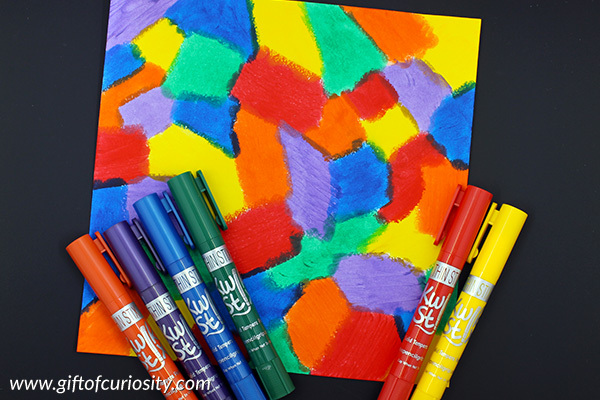 Kwik Stix solid tempera paints sound like they would be perfect to use with my grandsons and preschool class. I’m sure they would have fun making and designing snowflakes. We will be starting homeschooling in 2 months time and this will be a lovely addition to our classroom! Kwik Stix solid tempera paints would be wonderful for my class to make snowflake gifts for their parents for Christmas! My class would love these amazing paint pens! What a great product to use for Christmas gifts! Thank you for offering these. I hope my class wins them. We want to do the scratch art snowflake project. I would love to use these with my preschoolers! These look amazing for art projects with my class!!! These look like so much fun! I would love to use these with my kids! They love painting, and they aren’t usually too messy, but these look like easier cleanup. My three year old will love these! Her preschool teacher told me that she does every craft option available each day. So cute! I’m excited to fill her stocking with “big kid” art supplies. What a great mess free addition these would be to my work bag! These little gems would give me plenty of opportunities to pull language out of my students. Asking questions, answering questions, making predictions, describing…the possibilities are endless!!! These would be a wonderful addition to my preschool art center! We have been looking at the kwikstix and would love to try them! I really want to try Kwik Stix! And I love this scratch art idea! These would be an awesome addition to my library programs. 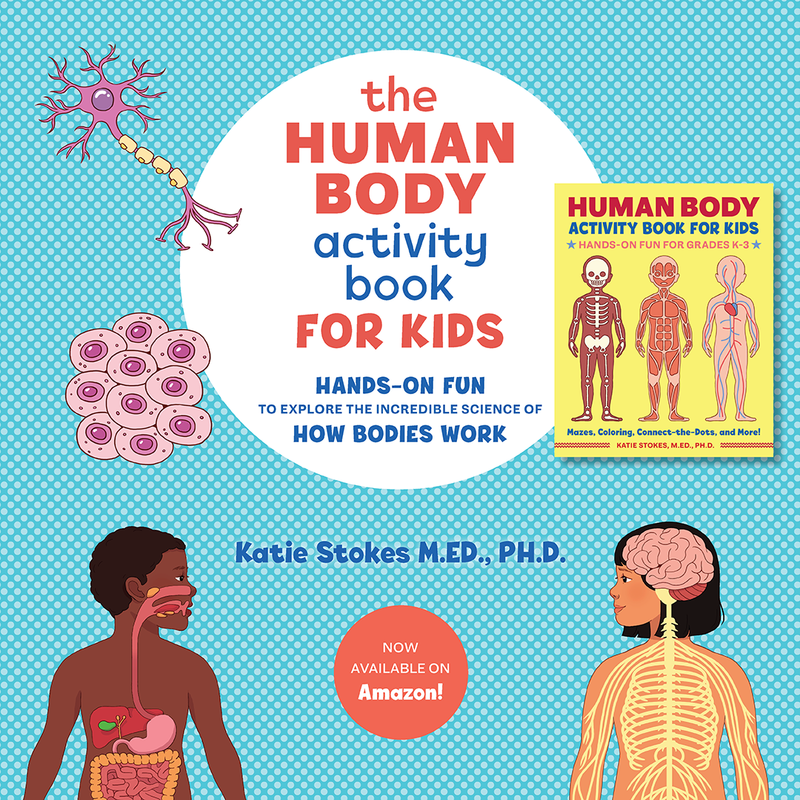 I can see kids and teens…and even adults loving them! No mess paint, a preschool teacher’s dream! !